“I believe life is a journey and that we’re here to learn and grow spiritually. I also believe dogs are a gift from the Divine sent here to help us on our way. 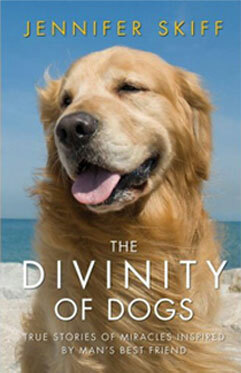 The Divinity of Dogs is about people’s moments of enlightenment with dogs. It includes stories where love, tolerance, comfort, compassion, loyalty, joyfulness, and even death have provided inspirational lessons about life from experiences with dogs. Whether you believe dogs are divine or a gift from the Divine, The Divinity of Dogs gives you permission to accept what you know: dogs provide us with a clear example of all that is good. They are healers, educators, protectors, and tangible examples of divine love. For those of you who agree with this philosophy this book confirms all we know and puts an exclamation point on it! My dogs have been the reason I have woken up every single day of my life with a smile on my face. They have protected me from mean people and have given me insight into potential partners. They have been my children and my parents. They have loved me the most. I am among the ranks of millions of people who appreciate the souls of dogs and know they are a gift of pure love and an example of all that is good. More than anything, they have taught me how to be a better person. I’m not alone. The world is filled with people who have reached the same conclusion and are happy to share why. Joy Peterkin lost her home and belongings in Hurricane Katrina – but she still had her Chihuahua, Little Bit. Just as Joy was finding some normalcy in her life, Little Bit began persistently nudging a spot on her breast. In this book, find out what Little Bit knew that doctors didn’t. Scott Thornsley thought his life was over. He lost his job of 19 years, and his wife left him. He felt no one loved or wanted him. He decided to kill himself. At the very moment he chose to act on his decision, his Rottweiler Emma ran into the room, grabbed his hand ferociously, and pulled him to the front door. What happened next, in the darkest moment of his life, saved him.Mazie the Lab was on death row at a shelter. She was rescued by a prison canine training program and then by a service dog charity. Freda Powell was in her own battle with life. She had challenged autistic twin boys and was trying to survive the loss of her oldest son in a heartbreaking tragedy. The last thing Freda wanted was a dog until Mazie came and rescued her entire family.